So, a few weeks ago, I decided to try out a recipe I found on Pinterest for Taco Muffins. They were a big success, but I had a lot of ingredients leftover afterwards. I’m one of those people where if I don’t use or eat leftovers within a few days to a week, then they end up going to waste. 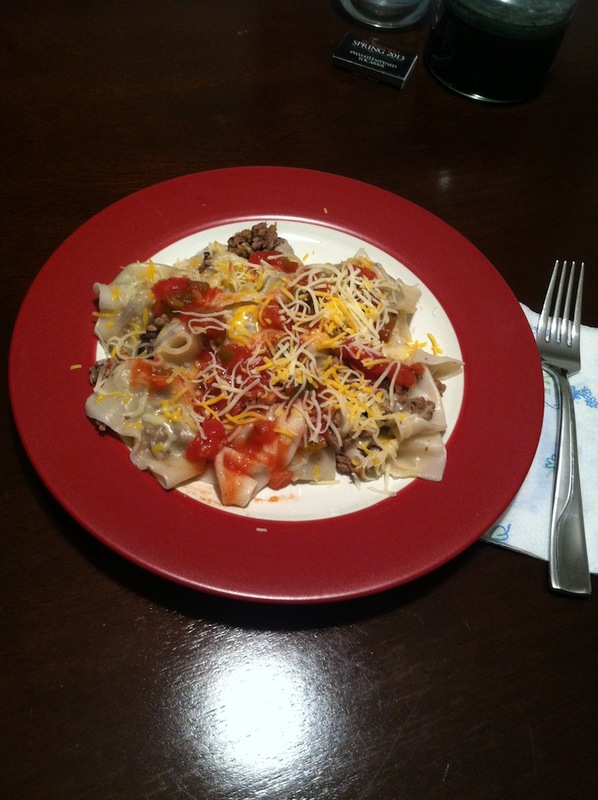 I really hate wasting anything, so I decided to see what I could use the leftover wonton wrappers, ground beef, etc. to make. I remembered seeing on the wonton wrappers packaging that it could be used to make raviolis, so early last week, I once again turned to the Internet to see if I could find any recipes to learn how to make ravioli from wonton wrappers. I found a video and a step-by-step guide with pictures and decided to give it a shot. Why not, right? All of the ingredients were the same. After all, they were leftovers. The only thing I added was a beaten egg. Whatever was left of canned your drained & rinsed black beans; I only used probably 1/3 of a cup. Wonton wrappers; one for each ravioli you want to make. In a sauté pan or large skillet, heat the chili oil over medium-high heat. 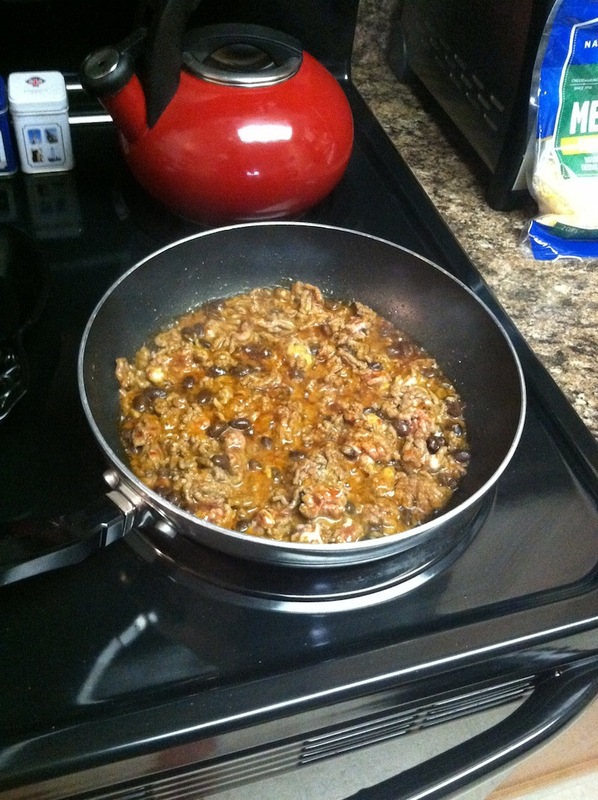 Add the ground beef and taco seasoning, cooking it as though you were cooking tacos. Add the black beans. Add cheese, as much as you want. Once it’s pretty much cooked, lower the heat on the stove to keep everything warm. Stir occasionally. 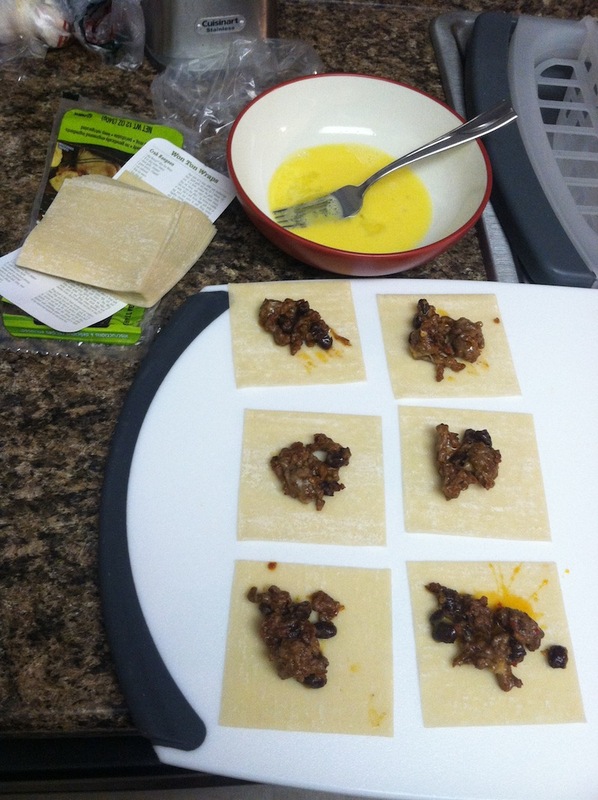 Lay out the wonton wrappers and distribute the taco mixture into each one to form the filling of each ravioli. 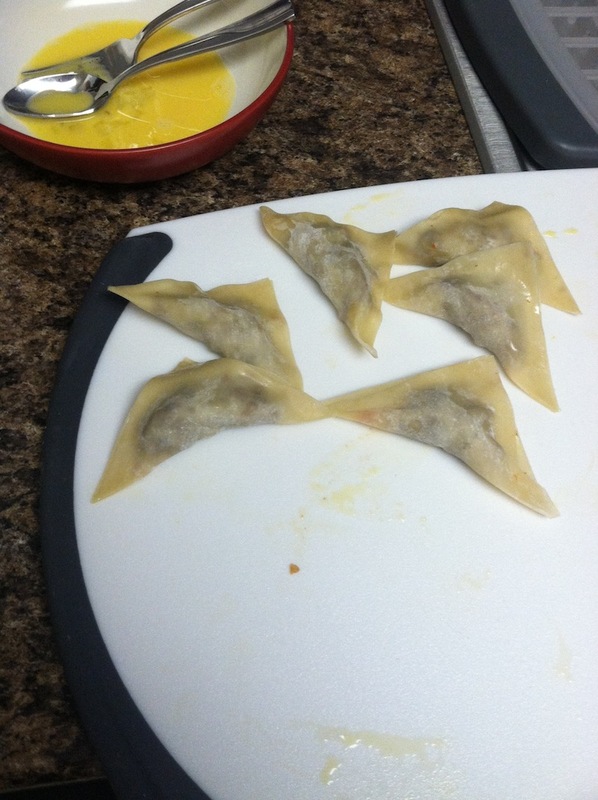 Line the end of each wonton wrapper with either some of the beaten egg or water and fold them in half. The egg/water helps to seal each one shut. Boil water and drop the sealed wonton wrapper/taco mixture. As far as the final product goes, instead of sauce, I used the salsa and more shredded cheese on top to complete the dish. I wish that I had remembered to get guacamole since Jay loves it, but alas, I forgot about it completely. In the end, I was kinda ‘meh’ about the results. Jay said that he liked it, but I think that there was something lacking. My main issue was that my portion wasn’t very warm by the time I got to it and cold wonton wrappers taste like wet noddles. Perhaps that was the difference between Jay liking it and me thinking it was just okay. Also, there were one or two raviolis that came apart in the pot and I ended up taking those, which means that I was eating just empty, boiled wonton wrapper at times. That said, I would try this again, but tweak the actually cooking part of the recipe a little bit. Perhaps double up on wonton wrappers so that instead of folding them in half, I can get more taco meat in by making one big square shaped ravioli. Either that, use something different than wonton wrappers, or else learn how to make ravioli/pasta dough myself to fill up with the taco meat. If you’re a more experienced cook than me, then you’ll probably be able to make taco raviolis way better than I could on your first try. That said, I’m glad that I made them and would do it again! This entry was posted in Arts & Crafts, Food. Bookmark the permalink.